Home Features Exclusive Jorge Lopez Delivers Mail and Sense of Community to I.V. Jorge Lopez Delivers Mail and Sense of Community to I.V. On a hot Saturday afternoon in Isla Vista, a bustling crowd with unconcerned laughter walked up 67 Trigo, eagerly heading towards whatever party awaited them. A handful came to a stop after spotting a familiar face, a man in his 40s bursting with the same energy and blissful attitude to match the large crowd. “JORGE!” they yelled in unison. “Jorge!” more voices followed. Members of the crowd could not contain their excitement at seeing the man on the other side. After all, he meant a number of different things to each one of them: the mediator of fights, savior from unexpected mischance, advice-giver, mood-booster, bearer of good and sometimes not so good news. This is Jorge Lopez, one of Isla Vista’s beloved mail carriers. 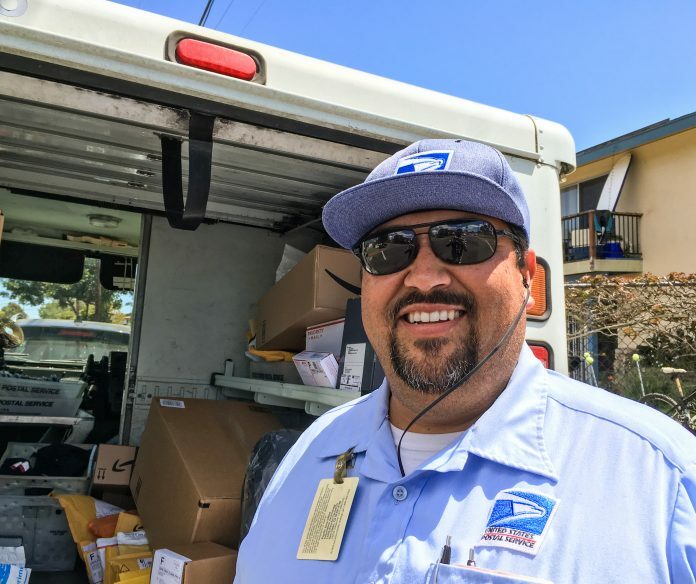 Lopez, 47, has delivered mail in and around Isla Vista for over 20 years. Throughout his long career serving the neighborhood, he cherishes the traditions and people that make up this small college community. He defends it from any unfair criticism by people who don’t understand life inside I.V. Residents of Trigo Rd., Pasado Rd. Fortuna, Sueno, or Seville may be familiar with Lopez’s friendly, “what’s up?” and “hey!” followed by a wide smile and laughter. Small gestures like these, he said, make both other peoples’ days and his own. But Lopez has also gone out of his way to help people throughout his route that are in need, to the extent that his job allows him. If he sees someone looking upset, he’ll approach them and try to cheer them up. When needed, he also gives people advice. He has helped countless students with bike problems, and even a group of girls who had trouble jump starting a car. At one point he recognized two guys fighting on the street and talked them out of the situation. His serviceable and friendly personality has earned him long-lasting connections with students and residents in the area. Before moving to Santa Barbara, Lopez lived in La Puente, California, and Mexico for some time during his early years. He credits his laid-back and infectious charisma as a product of being from el barrio, the neighborhoods where he grew up. Working 10-hour shifts, though, Lopez admits he doesn’t get to spend much time with his family — his wife Mischa Lopez, the assistant director at the Office of Financial Aid and Scholarships at UCSB, daughter Shayla, 22, and son Izaak, 18. But he found a home within I.V., where locals invite him to BBQs, drinks, weddings, and more parties than he seems willing to admit. He has cultivated a close relationship with members of the community, and he has seen some of them pass away. Although he often adheres to positive thinking, Lopez can’t help but remember, for instance, the death of four people back in 2001 who UCSB student David Attias killed. He also tragically recalls the 2014 Isla Vista shootings and how the victims were once friendly faces he delivered to. According to Lopez, the majority of mail carriers try to avoid routes in I.V. for its reputation of being “chaotic.” But Lopez always defends his community, which he has seen grow up despite harsh adversities and come together with compassion and generosity. He continued his route down Pasado, where there was a party outside, people jumping from the rooftops and onto a bounce house. The DJ recognized Lopez. “What song do you want me to play?” he asked Lopez, as more people waved.